Here’s something that has been a long time coming; the cover for the “Wilderness of Ordurak” adventure with art by Nate Marcel (and a few interior illustrations by him, as well). This is an adventure written for use with DragonQuest, but, it should be adaptable to other games. The original backers have gotten proof copies to look over. There are some known issues, so there’s a little editing and revision work to be done, yet. But this is finally just about complete. The original crowd-supported project proposal was for a 16-page adventure. This is presently clocking in at 54 pages (including the cover), plus there is a 12″ x 18″ region map. Some people who missed the original crowd funding period have asked about getting in on this project. It looks like IndieGoGo added a feature called InDemand that “lets anyone back you after your crowdfunding campaign is over.” However, I haven’t been able to enable that feature on the site. But, if anyone is still interested in getting in as a supporter at one of the Mercenary levels, let me know, and I will set up a selection at the Antherwyck House store to make those options available. There is not a good way to extend any of the Adventurer or Hero levels at this point, since those were options that involved input in deciding the content of the adventure. We’ll have more information about this adventure as it gets into production. There are only a few more Intersection maps from my Intersections series remaining to be posted. I’ve been thinking about doing something to collect the entire set and make it available in some kind of print form. Making a book would be obvious, but also not terribly unique, so I was casting around for other ideas, and landed on the idea of a set of cards. What I’m proposing is a deck of 26 cards, with the complete Intersection series on one side, and a set of semi-geomorphic dungeons on the other side. The two wouldn’t really relate to each other directly. The Intersections themselves don’t line up in any way, and the idea behind them was for them to be small snippets; places where other, larger things were coming together. 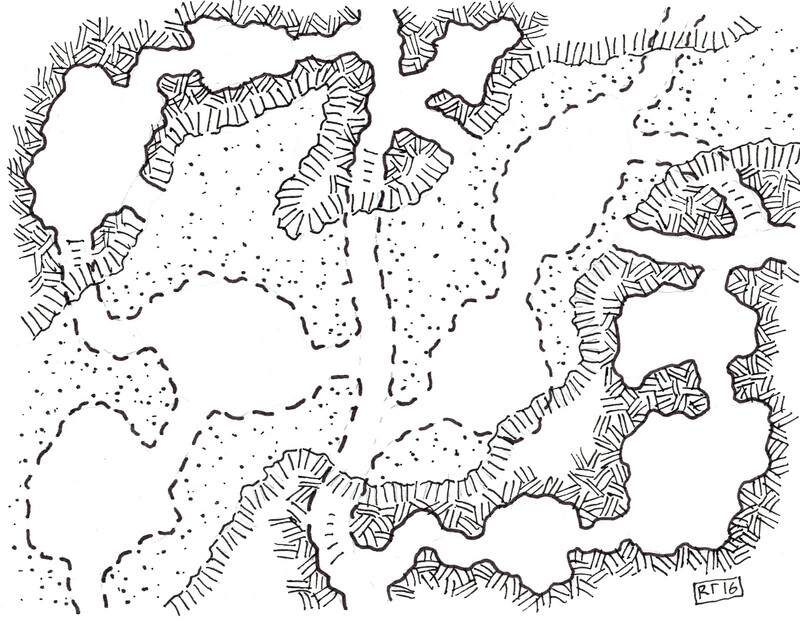 But the obverse set would be designed to be able to be put together to make a larger, interconnected dungeon. The idea here is not that any combination will work equally. Instead, there are different patterns for the cards, but with enough commonality that they can be combined in a lot of interesting ways. The test image shows a number of these cards laid out together. The notches represent the locations where connections extend off the card. So, you can see, there are different arrangements on different cards, and not every card neatly lines up with its neighbors. But this creates some possibilities for longer corridors and for larger rooms. So, what I’m wondering is, if there would be much interest in something like this? The Intersections are complete; it would be a matter of getting the semi-geomorphs drawn. There are lots of maps and map makers out there. What would make you consider spending a few bucks on a set of these cards? Work in progress for a project. The chambers and the hex grid (yes, it’s a DragonQuest project, so it’s on a hex grid) are done on computer, but then the hatching in the solid areas is all done by hand. I think the combination of the two is working pretty well, here. The whole thing will be included in the Wilderness of Ordurak adventure, which is being wrapped up now, and, for the time being, the complete version of it will only be included in there. This is another one of the series that is pretty stylistically removed from most of the others. It is meant to be a set of tunnels that connect across a small canyon opening, along with a couple of passages that connect to that canyon. 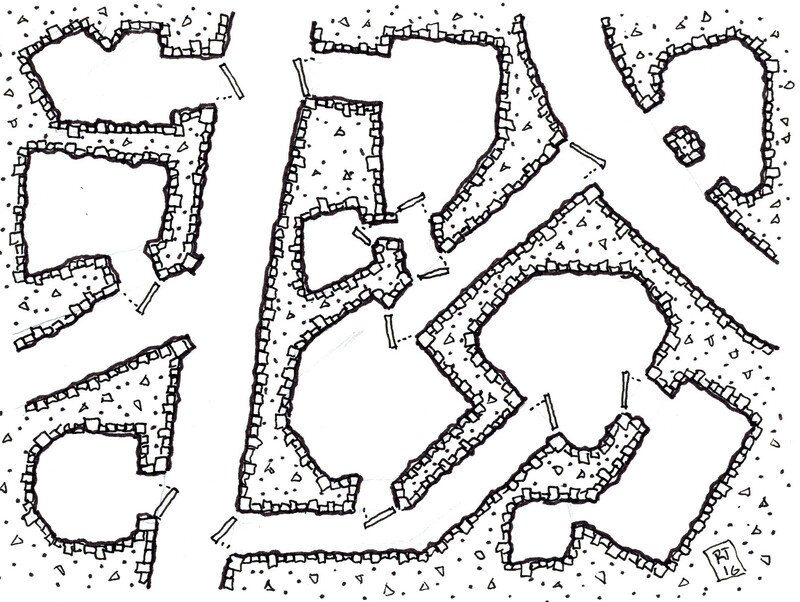 There are two levels to the map, and the lower level is indicated by dashed lines. Several rooms are beneath the floor of the canyon.